Before Sept. 11, 2001, Mohammad Ismail's career was on an upward trajectory. An architect educated at UNC-Charlotte, Ismail says he was a "rising star" at the Charlotte architecture firm where he works when the twin towers collapsed. Now, he's a man under a microscope, passed over again and again for job promotions that go to people he says are less qualified. His employers keep telling him the positions "just weren't a good fit." Like Ismail, Charlotte's Muslims say things didn't change right away after the attacks, that it was more of a gradual happening. Now there's a previously nonexistent Muslim glass ceiling in the workplace that Ismail says is constantly being lowered. You can hear the frustration in his voice when he talks about it. But it's the hurt of losing the companionship of co-workers Ismail considered to be friends that seems to bother him the most. Ismail was born in Bethlehem and moved here 21 years ago when he was 25. In the past, his Arab/Muslim background didn't matter much to his employers or his co-workers. He said he is a highly social person who used to be part of the social circle at work. "Before, we used to go out a lot, and now I'm not part of the circle anymore," he says. "I just don't get invited to many of the outings and things like that." There's a constant underlying tension now, and others at work make comments they didn't use to. These comments are never threatening, almost always phrased as a joke, but they hurt just the same. "How many wives do you have?" people ask Ismail, or "Are you a sleeper cell?" He brushes the comments off and says nothing to his employers, convinced that complaining about the harassment would make him less marketable than he already is. He says he and his wife recently decided that she would wear a hat rather than the traditional headscarf worn by Muslim women because it was making her too much of a target. Everywhere she went, he says, people were staring at her when she wore the hijab. Women at department stores made comments or treated her with less respect than they did other customers. A half dozen interviews with Charlotte Muslims yielded similar stories. While none had been threatened, they feel like they are increasingly living under a microscope with a resolution level that just gets higher and higher. A recent USA TODAY/Gallup Poll showed that anti-Muslim sentiment is growing among Americans. Nearly 40 percent said they felt "at least some prejudice against Muslims," and a third believed that America's Muslims were sympathetic to al-Qaeda, USA TODAY reported in August. The poll also found that 40 percent of Americans believed that Muslims should carry a special identification card to help prevent terrorist attacks, regardless of whether they are American citizens or not. Another 22 percent said they didn't want Muslims as neighbors. That could explain the results of another study by psychologist Mona Amer of Yale University School of Medicine that showed much higher rates of depression in America's Arab population than in the general population. About half had symptoms of clinical depression, compared to 20 percent of Americans. Because there was little study of Muslim psychology before Sept. 11, it's hard to say whether the results are because of an increasing sense of alienation or because of something else inherent in Muslim culture, or both. But the study did show that Arabs who were able to form bonds with people outside their ethnic and religious groups were less likely to be depressed. In that regard, Arab Christians had a markedly better time fitting in here and were more psychologically healthy than their Arab Muslim counterparts, the study found. That sense of alienation mentioned in the study's findings is very real and is becoming more common in the Muslim community, Ismail says. After 21 years here, Ismail recently began seriously looking for employment abroad in Dubai, Saudi Arabia. That's a pretty staggering statement about the condition of Muslims in America when you consider just how integrated Ismail is in the Charlotte community. He sits on Charlotte Mayor Pat McCrory's Mayor's International Cabinet and has served on various Charlotte-Mecklenburg Schools committees. Yet after more than two decades here, his unease has reached a point where he has actually traveled to another country in search of a place where he fits in. But in the process, he ran into another problem. He no longer felt comfortable there, either. "I am just too much of an American to try to fit back into the Middle East," says Ismail. "I can't fit now in the US, so it's becoming kind of like an unsettling feeling." Like Ismail, Khalid Hijazi, a Palestinian with permanent residency status who has lived here for 20 years, blows hot and cold on America now. "People stare at us," he says of his wife and family. "Muslims are depressed because they see themselves as demonized people. We are going through the same struggle as blacks did in this country." But Hijazi also talks about why he loves this country. "I love this country for the Constitution and the freedom and because the people in this country are civilized and because it is an industrialized country," says Hijazi. "Despite everything that has happened, the people who live here are more tolerant than any other people in this world." Not all Muslims share Hijazi and Ismail's views. While Hijazi describes the stares his wife gets in public as part of the "agony" she goes through in order to wear the hijab, Rose Hamid describes the same phenomenon with an amused smile on her face. Sure, Hamid agrees, people do stare at Muslim women when they wear the hijab. But she has a more positive attitude. They're staring because she looks different, she says, just like people do when someone dyes their hair purple. But no one has ever been hostile to her. "People that stare, they don't do it in a negative way," says Hamid. "It's like, wow, that's a unique thing. It is usually because they are curious. I don't mind that." And Hamid would know about stares. As a flight attendant for over two decades, she's front and center on a daily basis as she walks through the airport. But Hamid has an asset that not all Muslim women, or women in general, do -- a bubbly personality, a smile that instantly gets you in a good mood and excellent people skills. People often ask her if she's Muslim, but the response she gets to that isn't negative either, says Hamid. One woman who commented on Hamid's head scarf recently told Hamid "good for you" for having the courage to wear it. 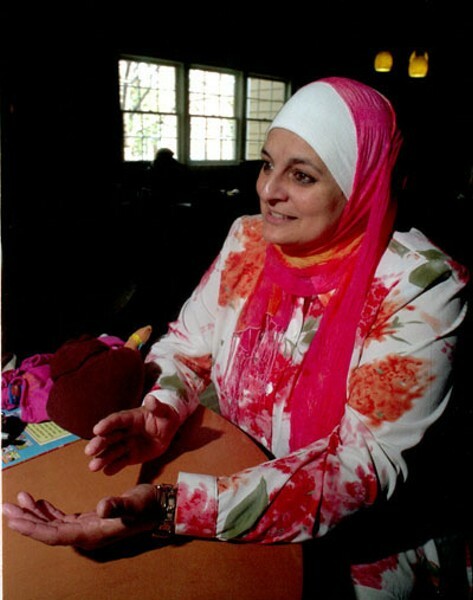 In some ways, says Hamid, Sept. 11 improved things for her. For a long time, she fought a battle with US Airways over the head covering, which they wouldn't allow her to wear while flying. Instead, they gave her a job training flight attendants on the ground. But thanks to the more politically correct atmosphere that followed the terrorist attacks, Hamid was finally allowed to return to the air wearing her hijab last August. Things are going well for Hamid, but she acknowledges that this isn't the case for many of her fellow Muslims, who she says she often hears are having difficulty finding jobs or advancing in them. These are professionals, she says, highly talented people who never had problems before Sept. 11. There may be something to that. A new study shows that wages and weekly earnings for Arab and Muslim men living in the United States fell 10 percent following the Sept. 11 terrorist attacks. The study measured changes in wages of first- and second-generation immigrants from countries with predominantly Arab or Muslim populations between September 1997 and September 2005 and compared them to changes in wages of first- and second-generation immigrants with similar skills from other countries. "I was surprised," says study co-author and University of Illinois at Chicago Professor of Economics Robert Kaestner. "We see an immediate and significant connection between personal prejudice and economic harm." After Sept. 11, Arab and Muslim Americans worked as often as they did before the attacks, but they worked in different industries paying less on average than the industries they used to work in, Kaestner noted. Like psychologists and researchers who study trends in the American Muslim community, Ismail worries about the impact of the increasing feelings of alienation in his community and what it means for the future and the war on terror. "When I went back home, I was constantly preaching against them," Ismail says of the terrorists. "When I'm here, I'm trying to explain to my colleagues and friends that not every Arab or Muslim is a terrorist, but I feel like the message is not getting through." Ismail sees the situation as a victory for terrorists who seek to isolate Muslims from non-Muslims. "The terrorists are winning on both fronts," he says. "They are radicalizing the Muslims and the Arabs in the West and they are isolating the people that are supposed to bridge the gap to the Muslim or Arab world. We are the bridge that is falling apart. If I am having difficulty and I have been living in Charlotte for 21 years, I can't imagine what the future will be."